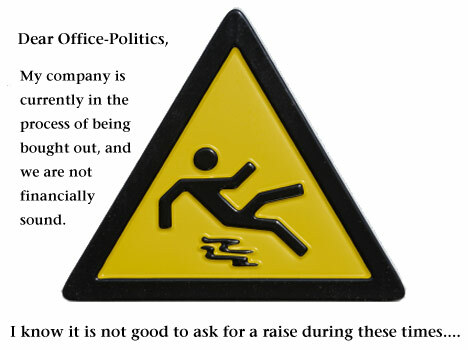 Office-Politics » How do I approach my boss to discuss a raise? I’ve been with my current company for exactly a year yesterday. During my tenure, I believe I’ve proved myself to be intelligent, capable and trustworthy. My current position is an analyst, but I do so much more than that of an “analyst”. My boss, increasingly gives me more responsibilities, and I’ve handled those responsibilities very well. As I mentioned, I’ve been there for a year. Year end, I did receive a bonus, but did not receive a pay raise, and I am not sure when pay raises occur. I’m pretty sure it does not occur when you’ve been there for year, since a year has past and I didn’t receive one. I do not know how to approach my boss to discuss a raise. That being said, one more thing complicates things: My company is currently in the process of being bought out, and we are not financially sound. I know it is not good to ask for a raise during these times, but the buyout has been happening for half a year already, how long am I supposed to wait? On top of that, I know that my boss and my VP received 25% salary increases last year, but the company is “cutting costs”? Doesn’t make sense. I guess my problem is multi-faceted in that I want to ask for a raise, but don’t feel like it is the right time given the companies financial strength, don’t know when raises are given, and know that people recent received 25% increases in salary. The current VP used to be an analyst last year making $120K, I’m making $90K… I know I am a better analyst than he was, but he became VP by default because our other boss left. Now he is making $150K, but I’m still at $90K, and I do more work than he does and know more than he does. In fact, I’m spending all my time cleaning up his mistakes when he was an analyst, and he’s surfing the internet, chatting it up with colleagues, leaving early for basketball games, and always walking around just chatting. It frustrates me that I work twice as hard and know twice as much as he does, yet I make substantially less. He’s been there for 3 years and I’ve been there for 1 year, but I have 4 years of experience and he has 4 years of similar experience. You have a very precarious situation with the company’s financial status and the current economic outlook. You’ve brought up some very good issues about managing your own economic worth in difficult times. By wording it this way, it prevents him from being on the defensive. Now, you may want to be prepared for the fact that the answer could be you’re not getting one (based on the buy-out, the company’s position, the current economic outlook, etc.). The second issue you bring up is a little cloudier, but I see it played out in workplaces across the country daily. You’re falling into the trap of comparing yourself with others, and letting that drive your motivation to perform. John Stacey Adams created the Equity Theory of Motivation (about the only motivation theory I really like). In it, he stated that we create an imaginary equation in our heads, comparing our inputs and outcomes with that of another person in the organization. If we perceive that the other person’s ratio is better than ours, we take steps to bring it back into equilibrium. Some of those steps include asking for more money/rewards, doing less work, rationalizing the inequity, choosing somebody different for comparison, or just leaving. The bottom line is you control the equation. You still make the decisions about what is fair. If you don’t like that the VPs (who, by most organizational charts, are higher than analysts) are making more than you, then you get to make the decisions. The last issue is one of a heaping dose of reality. The job market and the economy are not the hottest. I wouldn’t recommend making a leap from this employer unless you have another employer in line. From experience, I’ve learned that running away from an employment situation generally just makes one miserable. And “taking your ball and running home” doesn’t do much for your professional credibility. Running to a better situation is always the route to go. You are an employee, and your employer gets to call the shots on what you are paid and what you do. However, you call the shots on whether you want to put up with it. 2. Second reason of course is the ethics related company’s financial status and the current economic outlook. But after the meeting it left me with a feeling of lost meeting and I could have raised this topic. After reading your reply above, I am planning to approach N+2 boss at least to set expectations but still am not feeling perfectly right! Can you please guide me how can I approach this situation?